Auctions have been coming to us from our ancestors, the recently passed ancestors and not the cavemen ones. Anyways, auctions are in some cultures considered tradition and happen widely across the world. Many things are sold out in an auction, mostly priceless objects like vases, state of the art projects.etc. Basically an auction can be held at various places and how it works is basically people (standing or sitting) present there, will name their price on the object. They take on turns and the person who says the largest amount and nobody else is able to pay that much, the object is theirs. Similarly, cars are sold at auctions and people win them, here are some of the world’s cars sold with the highest price at auctions. Now this car was sold to Jo Schlossberg (an emerging privateer racer, planned to share driving duty with his friend henri oreillier who is an ex professional skier and the hero of the French resistance in world war II, During the car’s second race, Oreillier was killed at the wheel in a crash at Coupes du Salon. The heavily damaged vehicle was repaired at the Ferrari factory and sold to an Italian privateer who used it to win 12 of the 14 hill climbs he entered in 1963. 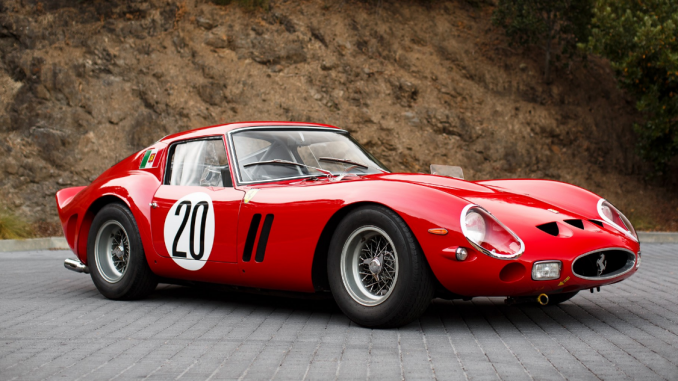 This car is the one and only Chassis 3851GT sold of the amount$38,115,000 at an auction in California. A true barn find, this Ferrari 250 was intended for an eventual museum exhibit by owner Robert Baillon, but it spent its time in a museum, a collection with around 100 other cars. When 59 of them eventually went to auction, this Ferrari blew away the competition, and its $18.5 million price tag went a long way towards the $28m total generated by the auction. Chassis 0674 began life as a Scarlatti-bodied 315 S factory race car, but soon made a lot of progress and later entered by Scuderia Ferrari in the 1957 12 Hours of Sebring. Driven by factory drivers Peter Collins and Maurice Trintignant, it finished sixth. The 315 S was handed to driver Wolfgang von Trips that May for the Mille Miglia, Italy’s famed 1,000-mile race across closed public roads. 1954 Ferrari 375-Plus Spider Competizione Sold for: $18,400,177 Auctioneer: Bonhams Date sold: 27 June 2014. So here you have it folks, the most expensive cars ever to be sold at auctions!